Accessories: Accompanied by Patek Philippe Certificate of Origin dated February 28, 1989 confirming that the present gilt metal timepiece with photoelectric quartz movement and cloisonné enamel "La Nature" decoration is a unique piece and original invoice dated February 28, 1989 stating a reduction of 3,000CHF and net charge of 25,500CHF. Furthermore delivered with Patek Philippe service receipt dated July 8, 2014 and Patek Philippe Extract from the Archives confirming production of the present watch in 1980 and its subsequent sale on February 29, 1989. Originally consigned by the family of the original owner at auction in the past, the present desk clock is nothing short of spectacular. Dubbed "La Nature", this timepiece is confirmed by the Certificate of Origin as being a unique piece. Rendered in polychrome enamel with deep shades of orange, red and maroon, the present clock depicts women among flora and fauna. Undulating leaves and branches rise and fall throughout the tableau, while the side panels are designed with delicately painted birds. Composed in a cubist style, there is an emphasis on a flat, two-dimensional surface, along with an abstract interpretation of space and dimension. The desk clock is the perfect canvas for an artisan to showcase his or her ability to create beautiful paintings. To apply enamel on the panels requires extremely delicate handling and high technical ability, as enamel is particularly prone to cracking. The relatively vast space furthermore enables the artisan to exhibit a wide range of color and design. 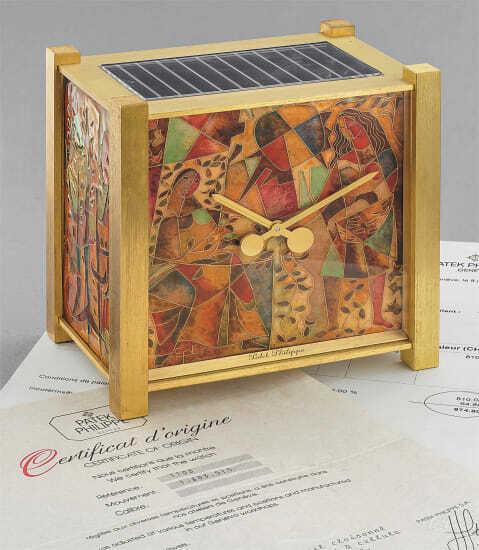 Offered in pristine condition, this desk clock is replete with its original certificate and invoice, stating the original price of purchase in 1989 for 25,500 CHF at the Patek Philippe Salon. Interestingly, this clock sat in the boutique for nine years before its sale in 1989. Today, it is one of the rarest and most desirable enamel clocks on the market, attesting to Patek Philippe's vision, which was completely ahead of its time. The enamel of this clock was created by Elisabeth Perusset Lagger, a master enameller, who created polychrome enamel masterpieces for Patek Philippe in the second half of the 20th century.